This awesome new radio is simply amazing! We have a limited quantity of X9D's so order soon and get it fast! First come, first served! This radio blows away everything you have seen in its price class, as well as most much higher priced radios! It will continue to work with most existing FrSky receivers, as well as the new X8R which will have 16 channels available! New Smart port sensors are available and more are coming soon. See the Accessories section for more details! *Pro Tip: Interested in running a Taranis X9D with up to 32 channels? 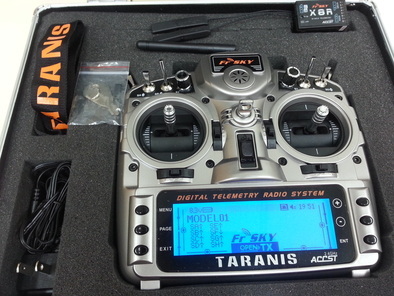 You can have a 32 channel system by buying a Taranis X9D, along with an XJT module and another X8R receiver. The Taranis can be setup to run both the internal and external modules simultaneously, giving you 16 channels on each X8R, providing 32 channels total using PWM and S.Bus outputs! Contact us if you have any questions. We have all of the S.Bus accessories needed to do this! Please note, shipping for international orders will be added after the sale, or contact us for an invoice with the exact total before ordering. The weight will be around 6 to 7 lbs, so it must be Priority Mail (no 1st class). Please, one radio per order otherwise additional shipping charges may apply. Shipping out starting Feb 3rd! UPDATE: Shipment delayed due to weather in Asia. Might be a day or two late. Looking for Taranis X9D functionality but don't want to buy a whole new radio? See below for the new XJT Module that the Taranis has internally, and the new X8R receiver to go with it! 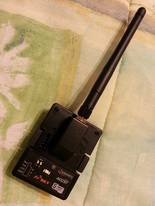 This is the newest FrSky Technology for your JR socket Transmitter. Use with the new X8R Rx to get the full 16 channels! Also works with older V, D, LR, and X series receivers such as the very popular D8R-XP, D8R-II Plus! This receiver is FrSky's newest receiver featuring 16 channels (8 normal pwm outputs and all 16 channels on the dedicated Sbus output). Plus the exciting new Smart Port for the newest sensors! This model with standard antennas has been discontinued, so once these are sold out, they will no longer be available. However, you can buy standard wire antennas and replace the PCB antennas in the future if you wish.